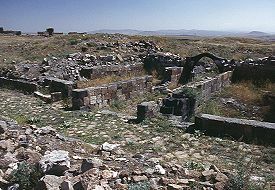 Ani was a very densely populated city. Apart from the larger churches, little of this urban layer is now visible above ground. 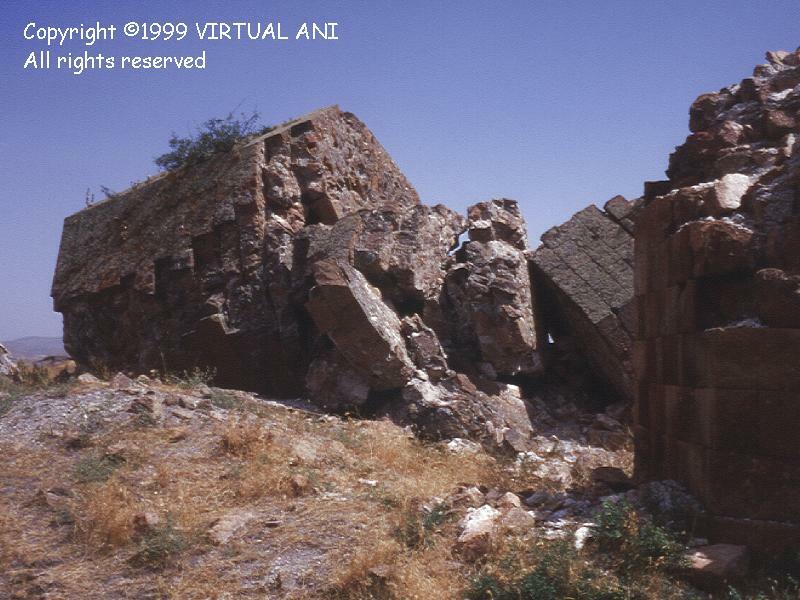 Most of the lesser buildings were poorly built when compared to the churches, and have collapsed into the shapeless field of rubble that covers most of Ani. 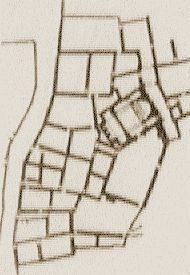 Buildings covered the entire flat area within the city walls, with suburbs that extended northward beyond them. Apart from domestic houses there were shops, inns, warehouses, baths, small churches, mills and presses, factories for small scale industries such as handicrafts, potteries, metalworking, etc. Some churches stood in their own courtyards or open squares, but most of the city's urban structure was unplanned and irregular in shape, with buildings closely crammed up against each other. Main streets originated at the three gates in the outer walls and ran southwards towards the citadel. 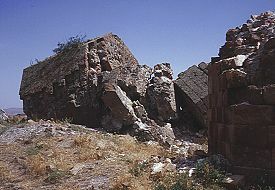 The only street clearly visible today runs from the Lion Gate towards the Mosque of Minuchihr, passing by the fallen minaret of the Mosque of Abu'l Muamran. 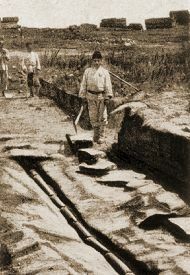 Excavations of this street by Nikoli Marr in the years before the First World War, revealed a paved roadway that had an earthenware water pipe running underground down its centre. 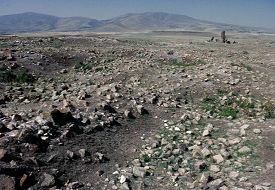 This road has also been excavated by the Turkish archaeologist Beyhan Karamağaralı, starting in 1991. 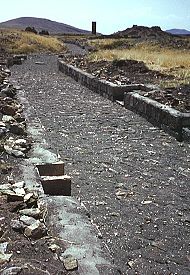 This is one of her excavation's survey drawings of the road. 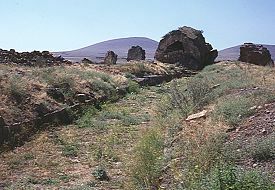 Karamağarali also uncovered the foundations of several buildings along the route of the road. 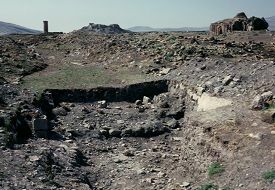 This plan shows a structure excavated in 1994. It was a large building, stone built and originally rising several storeys high. 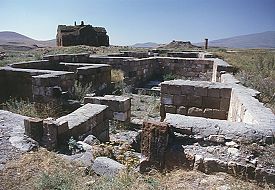 It was probably the residence of a merchant or a member of Ani's administrative class. Its most interesting feature is the large underground basement at the right, still with its original roof. This is over 26 metres long and is lit from above by a series of rectangular roof vents. 2. 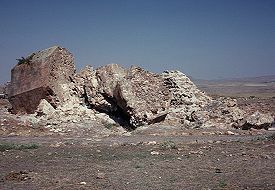 Looking to the west, from near the "Lion Gate"
Almost nothing remains of this mosque except for the large fragments of its minaret which fell down only in 1890. The minaret was a very tall octagonal tower that featured prominently in many of the early engravings of Ani. 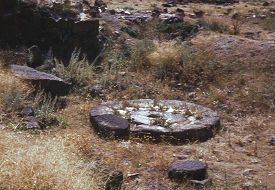 The still intact fragments show it to have been built of high quality masonry, with a spiral staircase running up its core. The minaret had an inscription on it, written in Persian and dated the year 595 (1198-99 AD), which forbade "the sale of sheep and camels in front of this mosque of Abu'l Muamran". 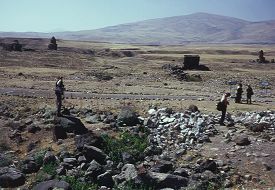 This page [road passing the fallen minaret] was first published in 1999. It was last modified on the 4th April 2000.